Happy Earth Day! GWL has been very busy since last fall. We've hired new staff, expanded our partnership with Mass Audubon by housing an Education Coordinator (Nia Keith) at GWL, moved to the third floor, designed the Spicket River Greenway and 3 new community garden sites. received some exciting awards and great press, and planned an amazing calendar of events. We are currently planting 50 trees with Lawrence homeowners through our GreenStreets program and look forward to another successful Arbor Day event on April 29th. Learn more below and visit our redesigned website! GWL has the opportunity to buy a gently-used 12 person van to take Green Team and Summer Stewards on field trips and to support events such as Earth Day, Kite Festival, and Spicket River Cleanup and our Fresh Food Programs (CSA, Farmers Markets and Community Gardens). We need to raise $15,000 for the purchase price and initial insurance premium. You can donate specifically for the van online. While you are there, check-out our inkind donation needs for our new learning kitchen. Thank you for your support! 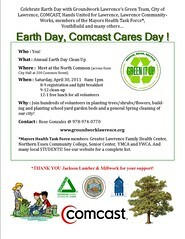 Join GWL, the Green Team, Comcast, Radio Disney, the City of Lawrence, Mayor's Health Task Force, Hands United for Lawrence, Jackson Lumber and Millwork, Lawrence CommunityWorks, YouthBuild and many more partners and help us keep the momentum going in cleaning up and greening the city. The day begins and ends on the North Common by the bandstand. Registration starts at 8:00 with free t-shirts, coffee and pastries, with opening remarks to kick-off the day at 8:30. Radio Disney will be broadcasting live and leading activities on the North Common all day. Beautification projects are planned for throughout the city and we'll also be building garden beds at South Lawrence East and GLFHC Park Street and working on the LHS garden. We'll be finishing the day at 1:00 with a free volunteer lunch back at the North Common. If you are interested in joining us and want more details on the city-wide cleanup, please contact Rose Gonzalez at 978-974-0770 or by e-mail. Don't forget to sign and bring your waivers! If you are under 18 you must have permission from a parent or guardian. Spicket River Greenway Bid Period is now Open! 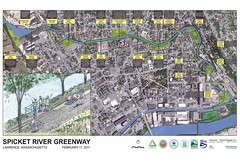 who attended February's Greenway public meeting. We have been hard at work turning ideas collected over the last decade into an amazing design. Bid materials are available for pick-up at Munro Graphics and the bid period ends May 18 at 2:00. Construction starts in June and will be completed by June 2012. Read more about the Spicket River Greenway and mark your calendars for the 10th Annual Spicket River Cleanup on September 24! 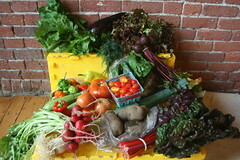 With spring comes the time to plant and dream about local, fresh food. GWL is now accepting applications for farmers and other vendors to participate in our Wednesday and Saturday markets. CSA registration is going strong, so sign up before we sell-out! You can help us raise $10,000 to subsidize CSA shares for families and hunger-relief organizations by donating to the Groundwork Share-a-Share Program. Lastly, let us know if you are interested in becoming one of our community gardeners. Lawrence's Community Garden Network is Growing! 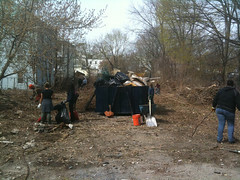 GWL, Green Team, Lawrence DPW, and the Farm School celebrated Earth Day by cleaning and grubbing one of our newest community garden sites at Guiffrida/Howe off Prospect Street. Construction is starting on 3 new community garden sites at Spruce/Myrtle Sts., Cross/Cedar Sts, and Giuffrida/Howe. These new sites are in addition to gardens at Brook Street, Cronin Park, Manchester St, Park, and Union/Mechanic. If you are interested in reserving a garden bed or learning more about our growing community garden network and workshops contact Rose or Maria. You can see how busy spring is and GWL is also preparing for the summer! We are hiring Team Leaders for our Youth Programs and will be recruiting for a Market Manager soon. Stay tuned for our next newsletter where we'll give you an update on GWL/Mass Audubon summer youth programming, the July opening of the Farmers Markets, and Kite Festival and other events. Also, save June 9th for a volunteer playground build at the Arlington School. The playground is being built through support from New Balance, KaBOOM!, and The Community Group Promise Neighborhood partnership. Until then, stop by and visit our new office on the 3rd floor, meet new staff, check-out the learning kitchen, and learn more about Mass Audubon's expansion into Lawrence by talking with Nia Keith as she settles into her new homebase at GWL. See you this Saturday!